Garage door openers have made our lives much more convenient, allowing swift and easy access to our garage without having to leave the car. Like any other device in your home, the opener is bound to malfunction at some point or another; if it’s a chain-drive opener something could be wrong with the chain, the motor itself can malfunction a any type, and programming and limit related problems are not uncommon. Whatever the problem is – our team at Garage Door Repair Denver is at your service, offering professional repair, troubleshooting and installation services. We want to make sure we are able to help our customers regardless of the brand they need help with or are interested in getting. If your Genie opener malfunctions or you’re interested in LiftMaster’s popular wi-fi model, rest assured we can deliver! We come prepared with new units on every job, so if you decide you want a new opener there and then – we’ll make it happen! Some problems are more common than others when it comes to openers however are simply to troubleshoot, such as the remote control not working. Some are a bit more complex, such as the door keeps reversing automatically, even when there’s nothing in its way. In this case the opener sensors are mostly at fault – or the opener limit. For us the problem doesn’t matter. We care about two things: Your safety and convenience. We are always prepared to tackle faulty openers, remote, sensors, receivers and even circuit boards, and so we’ll make sure your opener is up and running by the end of the day. At Garage Door Repair Denver, we want to make sure our customers get nothing short of professional services, high quality products, and long-lasting results. We know how convenient using your opener is, and how inconvenient it can be to find out your door won’t close – or move. We’ll be there as fast as possible and make sure you can forget there was anything wrong by the end of the day! Let us know if there’s anyway we can help. We’re at your service! Why is my garage door remote not working? If you can still open your garage door with the wall switch, chances are all you're dealing with is dead remote control batteries. However, that isn't always the case. The remote itself may be broken, but you need to first rule out the issue with the batteries. If your wall switch also fails to work, then your best course of action is to check the opener's connection to the power source. If you don't see visible evidence of damage, then you should contact a professional (like us) to troubleshoot the problem. 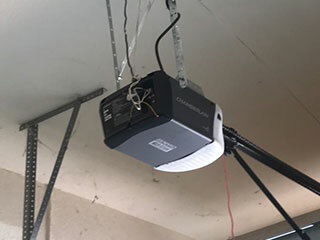 What are some useful garage door opener troubleshooting tips? When your garage door won't open your first troubleshooting tip is to check the batteries of your opener remote. Surprisingly, many people neglect to check that. Once you've ruled that out, you can try other things. Check the photo eye sensors to ensure they haven't gotten out of alignment. There may actually be a physical problem with the drive system, so check the condition of the chain, belt, or screw that the unit uses to move the door. Remember, most repairs require skilled hands and special tools, so if you're not sure of the problem, leave it to the experts.